Robert Yusim has a passion for helping inventors and companies launch their new Consumer Products. As President of Product Counsel, Robert is a leading expert in Direct to Consumer Marketing in the Consumer Product Multi-Category Marketplace. Through his 30 Year career, Robert has successfully launched hundreds of Consumer Products across most consumer categories including Housewares, Kitchen, Health & Beauty, Fitness, Hardware, Automotive, Toys and more. Early in his career, Robert was fortunate to work directly with his mentor Raymond Kives one of the founders of K-Tel and Quality Dino Entertainment. Dating back to the 1990’s Robert has been part of the success of many very successful As Seen On TV Consumer Brands including The Suzanne Somers Thighmaster®, Sweepa® Rubber Broom, Sophist-O-Twist®, Restform® Airbed, Gymform® & many more. 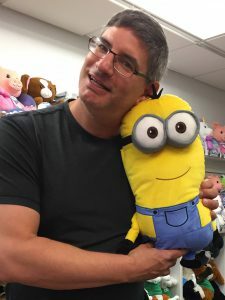 While continuing to work in all categories Robert is very well known for his amazing success in the Toy Industry and is credited for launching the Direct to Consumer craze in the toy/youth media space. Robert launched Spin Direct with Spin Master Ltd. in 2006 and on an exclusive basis, helped Spin Master introduce and grow many brands through DRTV, including Rocket Fishing Rod®, Moon Sand®, Pixos®, Bugville® Butterfly (Live Butterfly Garden), Air Hogs® (Havoc Heli®, Zero Gravity®, Vectron® & more). Since 2011, Rob has worked with a number of inventors and companies to help them launch their campaigns in the Direct to Consumer marketplace. Recent successes include Seatpets® – The number 1 promoted plush of 2013; Kurio® Brand of Android Tablets – A Huge retail success with $100M in sales! Wubble® Ball – the hottest Direct to Consumer toy and Retail Campaign from 2014 to 2019; Zippysack®, the number one selling promoted Bedding Product of 2015; Comfy Critters® – Very Successful Wearable Plush 2017-2019; LaserX® – The #1 Home Laser Tag Game on the Planet; Lunch Pets® his brand new Smash Success; and many more. Robert has also written many published articles and speaks at various conferences.